Of the 322 plugins, 127 had a potential security vulnerability according to RIPS. In total, 860 vulnerabilities were identified. When comparing this with the ratings of the plugins, we found only a small, negative correlation between the rating of the plugin and the number of potential vulnerabilities. To put it another way, plugin ratings are not a good measure of the security of the plugin. There are, of course, several problems with our analysis and conclusion. Biggest of those is that the sample size was really small compared to the total number of plugins (over 21,000 at the moment). To improve the results, we are currently analyzing a bigger sample (100% of them, to be exact). If you are interested in more details, the full paper can be downloaded here. Our company's (ByTheMark, that is) first mobile application is getting closer to publishing. It is a quiz game for learning and testing Python programming knowledge. Name of the app is Quiz & Learn Python. The game asks questions ranging from simple concepts to more advanced tricks in Python programming. The player has four lifelines at her disposal: remove two incorrect answers, skip the question, stop time and debug the program. The last one is what I think makes this game different from a typical quiz with questions about programming. Below is an image from the debugger. The game will be soon available for iPhone, other platforms possible later. You can test Quiz & Learn Python online. On the linked page, you can also register for our newsletter to be notified when the game is ready! A new year has started, so I wanted to look back on the books I read in 2011 (the idea actually came from this post by Tim Kadlec). Here is an almost complete list of the books somewhat related to web development or entrepreneurship. I've left out stuff I read for fun (like the Stieg Larsson's Millennium Trilogy) as well as the ones I did not enjoy. These are the good books! The gamma and beta attributes of the event object give the left-right and front-back rotation angles. Based on these values, the position of the ball can be updated (tiltLR is change of x-coordinate, tiltFB y). For the iPad, I've divided them by 3 to get a decent speed. Note, that I'm simplifying things here and not considering the fact that Firefox has an event of their own. Read the linked article for details. This works and the ball moves in a natural way relative to the browser window. Still, it is difficult to control it when the window gets rotated. Eventually, I'd like to disable rotation of the browser window. Is there any way to do it with HTML/CSS/JS? Or is this one of those things that require wrapping the webapp into a native application? In the first post about CSS3 and algorithm visualization, I had demos showing how to animate sorting algorithms using CSS3 transforms. Yesterday, when watching CSS3 First Look on Lynda.com, I learned about the CSS3 Flexible Box Layout Module and wanted to give it a try and improve the previous animations. The flexible box layout gives an excellent way to control the layout and ordering of elements on a page. All in all, it's really flexible. To give an example, let's work with the following HTML. would change the boxes to be in order box3, box1, box2 from left to right (view the demo, example 3). One of the problems with the original CSS3 algorithm visualizations was the calculation of pixels when translating the elements to animate array item swaps. The box model seems like a great solution for replacing the pixels with just changing the box-ordinal-group property. After creating a simple test case, I realized that it did not work as I suspected. The elements changed places, but no smooth animation was shown. After spending some time trying to fix my CSS I turned to Google. To my disappointment, it wasn't my code that was broken. Nor was it the browser. The box-ordinal-group just isn't one of the animatable properties according to the CSS3 Transitions specification. So, to sum up the experiment: flexible box model could be used to visualize sorting algorithms, if no smooth animation is needed. In modern browsers, that is. According to caniuse.com, browsers that support this currently are Firefox 3.5+, Safari 3.2+, and Chrome 9.0+. In addition, Mobile Webkit on iOs and Android support it. 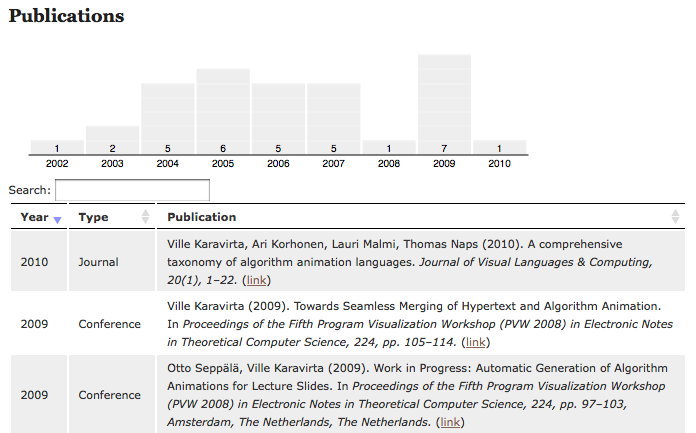 The result looks like the figure below (or my new publication list). Let me know what you think. Especially comment if you have problems with it, I haven't tested it on all browsers (yet). For more details, see the article on Mozilla Developer Center. Since it seemed easy to use, I wanted to give it a try. The result is a simple game where you need to "collect" a number of targets on the screen. Try it yourself if you have a laptop that is supported and has an accelometer, for example MacBook(Pro). Can you come up with an application for the use of accelometer in education?